Beautyqueenuk | A UK Beauty and Lifestyle Blog: Stocking Fillers you need to buy! Stocking Fillers you need to buy! For me, stocking filler presents are often more exciting than buying main presents and there does seem to be a lot of choice and variety out there right now. If you have someone who is a nightmare to buy for, someone who has everything or someone who never knows what they want (me) then a collection of stocking fillers can fill that gap and help you finish off that shopping list. Beauty crackers are one of those gifts that I have grown to love. I even wrote a post about them here. To that end, some brands have come up with some brilliant products and these are worthy of purchasing. FeelUnique have two brilliant crackers this year. 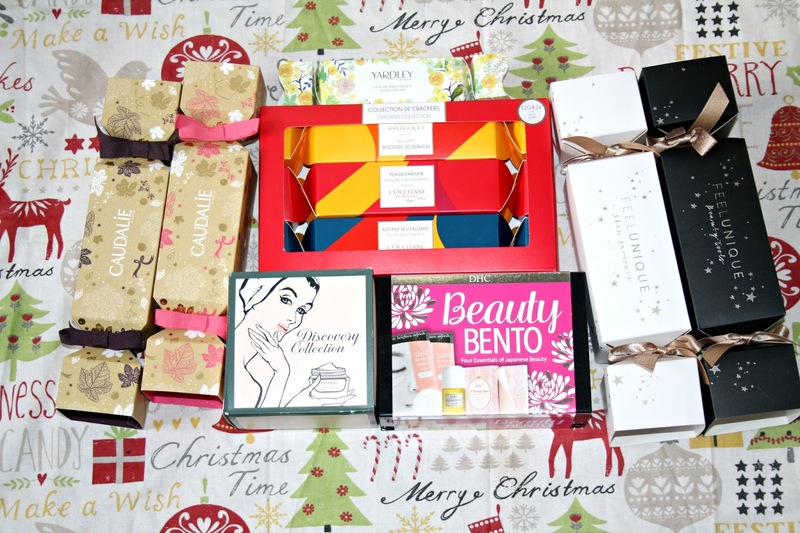 The Skin Saviours Christmas Cracker is packed with beauty treats that will see you through the festive season and includes Elizabeth Arden Eight Hour Cream Skin Protectant 5ml, Ole Henriksen Truth Sugar Glow Polishing Mask 15g, NUXE Reve de Miel Creme Mains et Ongles Hand and Nail Cream 30ml and Jurlique Calendula Redness Rescue Restorative Serum 15ml. The second cracker which is packed with Beauty Tools and they are U feelunique Silver Glitter Nail File 3.5", U feelunique Perfect Complexion Blending Sponge and a U feelunique Essential Eye Brush Capsule Collection. Both crackeres retail for £12. L'Occitane Festive crackers come as a set of three nicely packaged in a box. Each cracker contains three products which include a shower oil, bath cube and a hand cream and each one smells just wonderful. Caudalie have two crackers to choose from and again, it is a tough choice deciding between the two. The first one is Hydration Essentials and it contains Vinosource Moisturizing Sorbet 10ml, Vinosource SOS Thirst Quenching Serum 10ml and Moisturising Mask 15ml. The second cracker is the Body Essentials cracker and inside this one you will find Caudalie Nourishing Body Lotion 30ml and Caudalie Thé des Vignes Shower Gel 30ml. Priced at £10 each you can find them here and here. Yardley Lily of the Valley Cracker is exceptionally cute. Having had a bit of a makeover, Yardley is a brand that you can't help but love and like. This cracker contains a luxurious Nourishing Hand Cream with refreshing Lily extract, hydrating shea butter, moringa oil and sunflower oil, rich in vitamins A and C, it absorbs quickly into the skin leaving hands feeling soft,smooth and delicately fragranced, whilst conditioning and strengthening the nails. Priced at just £4 here it is an absolute bargain. The DHC Bento Box is another must have product. If you love Korean Beauty or want to discover it, then DHC is an amazing brand to start with. This box costs just £13 and inside there are 4 products which I absolutely adore. Firstly we have the Iconic Deep Cleansing Oil which is DHC’s worldwide bestselling makeup removing cleanser. Also included is the Ultra-nourishing Mild Soap for thorough-yet-gentle cleansing. Revitalising Moisture Eye Strips, to quickly brighten eyes and reduce puffiness and the final item is the 100% natural Blotting Paper, to reduce shine and absorb oil on-the-go. Gatineau Discovery Collection - This Box of treats is a delight at just £20 from Marks and Spencers. Featuring a 6 piece collection, worth £107 it is a great way introduction to Gatineau if you are new to the brand and a great way to experience the benefits of premium Parisian skincare. I have reviewed the box fully right here but inside you will find Gentle eye make-up remover 50ml, Melatogenine cleanser 50ml, Radiance enhancing gommage 15ml, Melatogenine futur plus anti-wrinkle radiance mask 15ml, Melatogenine AOX Advanced Rejuvenating Cream 15ml and Age Benefit Integral Regenerating Cream 30ml. So there you have it. A delightful collection of products which would make the most amazing stocking fillers. I think I am going to take the L'Occitaine crackers to my mom's house this year, such a lovely touch. Wow! The package is so stunning! They make me want to grab them all :'( Thank you for sharing!! This is a great idea. I may just buy all listed items and do a beauty basket for my girlfriends. Oooh I love the look of the Beauty Bento! But all of these would make lovely stocking fillers wouldn't they? Is it naughty of me to want them all? I would be happy with any of those in my stocking. The Gatineau Discovery Collection sounds great! You've got some great stocking fillers here, I love the look of those crackers! I love the idea of a beauty cracker and to be honest I just want everything. This would be a good gift to myself lol. These crackers look great. All full of lovely surprises :) I love stocking fillers like this. So many great choices but L'Occitane festive crackers are my favourite. I love some of the beauty sets out this year and the packaging helps make it as well I love the cracker style.